The government of Peru on Friday declared a state of emergency in a remote northern area after a clash between police and indigenous people protesting what they say is the exploitation of their native lands left a number of people dead. Police and indigenous protesters said separately that at least eight police and 22 protesters died. The clash took place at dawn outside the northern province of Bagua in the Department of Amazonas as police attempted to break up a roadblock on the 59th day of protests. Foreign Minister Jose A. Garcia Belaunde told CNN en Español that the state of emergency was ordered to give the government the opportunity to re-establish order and reopen talks with the protesters. Under the state of emergency, the army can be called on to maintain order. “Look, the use of force is legitimate,” he said. 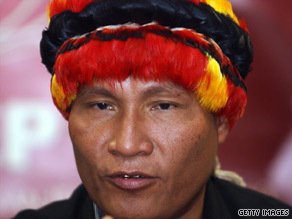 “Today, what we have received in response were gunshots — directed at police helicopters, killing eight or nine police.” But Alberto Pizango, the principal leader of the indigenous group, said his followers could not have been responsible for killing any police, because they were armed only with stones and arrows. He said the demonstrators had been pursuing a peaceful protest. Authorities have not confirmed the number of civilian deaths. The director general of the police, Jose Sanchez Farfan, said government buildings in Bagua had been looted and set aflame. Though a congressional commission has recommended the repeal of the laws rejected by the native communities, President Alan Garcia supports those that allow using the lands, maintaining that the richness of the Amazon belongs to all Peruvians and that a significant percentage of natural areas are already protected. “These people don’t have crowns,” he said about the protesters. “These people aren’t first-class citizens who can say — 400,000 natives to 28 million Peruvians — ‘You don’t have the right to be here.’ No way. That is a huge error.” Garcia called Pizango a criminal. Several days ago, Garcia announced an arrest warrant had been issued for Pizango, who is accused of inciting his followers to violence.